10g of Protein, 5g fiber, 1g omega 3 AND 2 servings of veggies per serving. They are alkaline-forming, free from dairy, gluten and soy, and contains no added sugar, artificial flavors, colors or sweeteners. That all sounds pretty good to me! All you have to do is add water. Choc-a-lot..favorite by far. I should have saved this one for last instead of drinking it first. I mixed this one with coconut water and WOWZA it was amazing good. Hands down the best Vega smoothie I have ever had. Think Almond Joy bar in a smoothie. This flavor had the most calories at 105, mixed with 1 cup coconut water adds about another 45 calories. A really yummy treat for only 150 calories. Vanilla-Almondilla, this was my second favorite flavor. Pretty yummy, although I mixed with milk and ice cubes which if you are really trying to be vegan it defeats the purpose I know. As I am a member of Team Beef, I am not worried about it obviously. Tropical Tango, not my favorite but I knew it wouldn't be. I am not a fan of tropical flavored things in general. I wish I would have thought to mix it with orange juice, but I didn't. I mixed with just water and meh. I never finished that one..the kids wouldn't drink it either. Bodacious Berry, I added frozen strawberries and blueberries to...YUM My kids approved of this one and I had to fight them off. Oh Natural, I tried the plain last. I have to be honest I was a little afraid I would really hate it and found it a lot sweeter than I expected. I was pleasantly surprised. I think it would make a great smoothie base. Color is a little unappetizing. My kids wouldn't even try this one. There is a warning on the label that consumption of flax seeds may cause temporary gas and bloating. I didn't notice anything crazy with bloating. The chocolate and almond vanilla flavors ..in a heart beat! 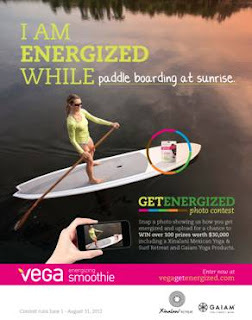 Have you tried Vega Energizing Smoothies? If so what did you think? that you can easily enter. Whether it’s running on a favorite trail, paddle boarding at sunrise, or getting down dog, we all have activities that invigorate and energize us. Simply upload your photo entry at VegaGetEnergized.com and encourage others to vote for your photo – the more votes you get, the more likely you are to win. There are over 100 prizes worth $30,000 including a Yoga and Surf Retreat to Xinalani Retreat in Puerto, Vallarta and Gaiam Yoga Products. Apparently, I didn't even read the labels! I didn't notice any gas or bloating, though. Phew. 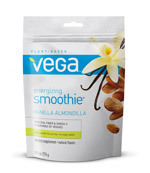 I LOVE VEGA...I drink a smoothie every morning, but I use the health optimizer formula in the big barrel...I mix it with almond milk, omega 3 oil, kale, a spoon of sweet potato, froxen banana or strawberries, cherries...it is delicious and oh so healthy!!! I did bloat for a while back when I first started it, but I was adding greek yogurt to it and when I stopped...so did the bloating!!! Those sound pretty good. The berry one with more berries added sounds like a winner! Thanks for sharing about these!! I am a huge fan of Almond Joy so I may need to check that out! They all sound pretty good.. would love to try them as I am always on the lookout for new powders and smoothie combos. 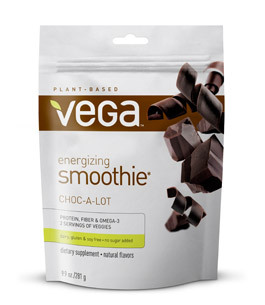 I do like Vega products--I haven't tried this one, but I've been using a lot of Vega One stuff in the green smoothies for the "challenge" this month. Their powders are the best tasting by far. Who wouldn't want orange socks? Motivation Monday: Beating the Heat.